Berko's leading scorer Matt Bateman was kept quiet against Thame United on Saturday. (File picture by Richard Solk). Berko were on a good run and oozed confidence on Saturday as Martyn Box struck the post in the first minute. The match drew the biggest crowd in the Southern League Division One Central that day and most of the 426 fans were happy home supporters when Corby took the lead in the 17th minute. A ball inside the full back from Elliot Sandy released Jordon Crawford on the left and he slotted past keeper Xavi Comas-Leon. Prolific striker Matt Bateman and Jonathan Lacey both put shots just wide for the visitors, before Corby went 2-0 ahead in the second-half when a deep corner was headed in by Joel Carta at the back post. Berko made a game of it in the 64th minute as Bateman netted his 38th goal of the campaign when an intelligent ball from Box set him up to round the keeper from an acute angle. With 12 minutes left Corby made sure of the points and ended Berko’s hopes of getting level. Crawford got the ball on the wing and centred for Carta to get his second goal from close range. The Comrades refused to give up and used three substitutes in a bid to salvage something. The closest effort saw Lacey rattle the bar with a free-kick in the closing stages. Third-placed Corby are now 14 points ahead of fourth-ranked Didcot Town, but nine adrift of the top-two with five games to go. 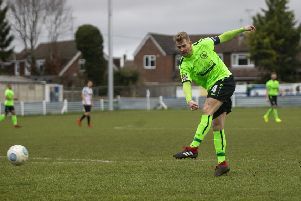 It means the automatic promotion spot for the champions – either Peterborough Sports or Bromsgrove Sporting – and the two home play-off semi-finalists are now narrowed down to a combination of these three sides. Other results on Saturday did go Berko’s way, with Bedford being the only one of the next six chasing teams to win. It’s extremely tight with just five points separating six teams in a bid for the two away playoff berths. Berko are just a place and a point outside the playoffs and host tenth-ranked AFC Dunstable this Saturday. They were next due to be in action last night (Tuesday) as the Gazette was going to press when visiting Lowestoft Town in the quarter-final of the CSS Challenge Cup. 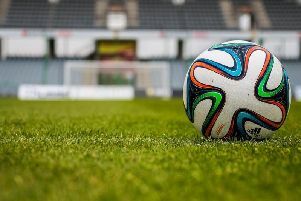 The semi- final draw is yet to take place but if Berko win that will take priority over the St Mary’s Cup semi-final at home to Chipperfield Corinthians scheduled for Tuesday, April 9.